Dundas-based Cafe Domestique and Canadian Cyclist are pleased to announce that $1700 was raised at the Toronto Bike Show earlier this month for IMBA Canada and the Ontario Cycling Association Youth Road program. For the second year in a row, Canadian Cyclist partnered with Krys Hines of the cycling coffee bar Cafe Domestique at the Toronto Bike Show in early March to offer espresso shots in return for donations to either local trail building efforts by IMBA Canada or the OCA Youth Road program. We would like to acknowledge the contribution of Jet Fuel coffee, who donated the coffee beans that were used to create the excellent espresso that was served. 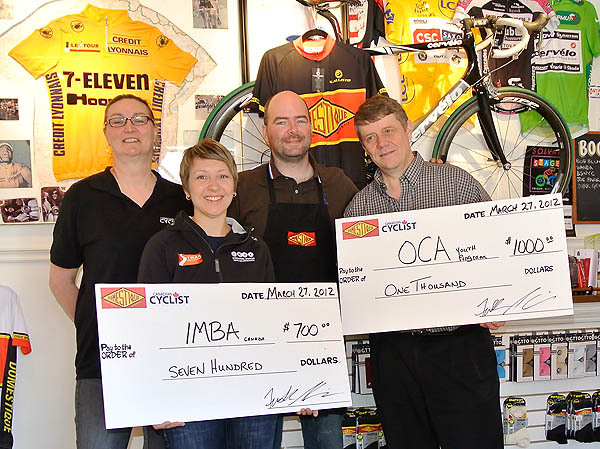 Donations could be directed specifically to either program, with the OCA Youth program receiving $1000 in donations, and IMBA Canada getting $700. The IMBA donations will be primarily directed towards Christie Lake trail construction in the Dundas area. "The level of contributions we received exceeded all expectations," commented Rob Jones, Editor of Canadian Cyclist. "Last year, we raised a total of $500, and we were hoping to double that. Instead we more than tripled the amount donated. We want to thank all the show visitors and the exhibitors who made it possible to raise this money for cycling programs." "It was so great to see the cycling community come together and support programs like these," said Krys Hines, owner of Cafe Domestique. "Anything we can do to help get people riding bikes is important. This just means that we will raise the bar even higher for next year." "Cafe Domestique and Canadian Cyclist truly embody the generous nature of the cycling community. IMBA Canada is grateful to both, for their support of the trail building efforts at Christie Lake, as well as the broader mission of creating more and better trail experiences for mountain biking nationwide. Together, we are creating a single track legacy that will be enjoyed for years to come." said Lora Woolner, IMBA Canada Executive Director.